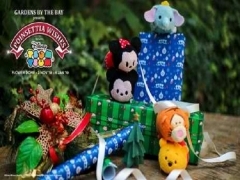 Receive Disney Tsum Tsum wrapping paper* with a minimum spend of S$40 on conservatory tickets. Redemption period is valid from 16 - 29 Nov 2018. *Limited quantities per day. Available on first-come, first-served basis. Giveaway is only valid for onsite purchase at the ticketing counters located at The Canopy. Receive a set of two (2) Disney Tsum Tsum wrapping paper with a minimum spend of S$40 on conservatory tickets in a single receipt. Promotion is valid from 16 to 29 Nov 2018. Limited to one set per transaction. Giveaway is only valid for purchase at Gardens by the Bay ticketing counters located at The Canopy. Promotion is NOT applicable at Gardens by the Bay’s online ticketing portal, or other ticketing counters. While stocks last daily, 16 to 29 Nov 2018, and is on a first-come, first-served basis. Promotion is not valid with purchase of Friends of the Gardens memberships. The Walt Disney Company and its parents, affiliates and subsidiaries are not responsible for the promotion, administration or execution of this promotion. Check out Gardens by the Bay for more details about this offer and to see all deals up for grab!